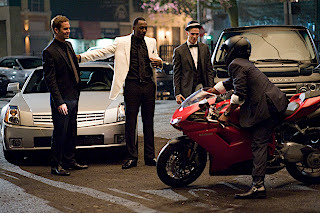 Tripling the opening weekend take of ensemble player Matt Dillon's thematically similar heist movie Armored that had been released just one year earlier, Takers became a surprise number one box office hit right out of the gate. Helmed by Sundance Film Festival award-winner John Luessenhop, Takers makes the most out of its pitch-perfect title by taking advantage of all of the movies from its genre that had come before it. 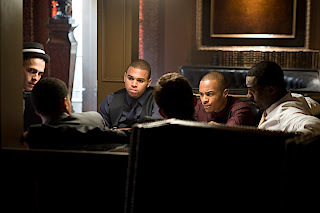 Although the filmmaker cites Michael Mann's masterful Heat as the movie that initially sparked the idea to tell his tale of cops and robbers through the eyes of a younger generation, Takers also tips its hat figuratively in terms of style and literally via dialogue, saluting acclaimed heist pictures from the past including The Italian Job , Ocean's 11 and The Thomas Crown Affair . Admittedly because the source material is so familiar and because Luessenhop's playing with a deck of cards we've nearly memorized by this point since we've seen countless variations of the basic “one big score” motif of an ensemble heist picture that lets us ride along with the good guys as well as the bad in a nearly equal timeshare, there's not a lot about Takers that we can't predict. Nonetheless, Luessenhop aces the formula magnificently thanks largely in part to a tremendously diverse group of actors, headed up by Idris Elba on the side of the villains and Matt Dillon holding court of the thin blue line of the law in a refreshing bit of against-type casting. All-around and weak scripting or dubious plot maneuvering aside, the impressive players infuse even the most cliched and/or least sketched out roles with a stunning combination of charm and complexity to ensure that there's no weak link in this overall chain of memorable, fascinating Takers , from the “token girlfriend” to a cop or robber who may not be on the level. Crisply transferred to an audibly and visibly razor sharp Blu-ray, Takers particularly leaves us breathless during the first daring heist and rooftop helicopter hijacking escape as well as in a crazily frenetic footchase that turns Chris Brown into Spiderman , during the last act. However, Luessenhop's passion for presentation heavily distracts us via excessive glamor shots of the robbers pieced together in hip hop music video style montage that temporarily pulls us out of the flow of Takers ' otherwise sharply edited, fast-paced action movie rhythm. The transition from an in-control stylish genre film to what appears to be a male version of a Vogue pictorial makes it seem as though the work already in progress had somehow flipped channels, somehow morphing into a series of ads for high-priced booze, luxury cars, designer menswear or lusty bling. Yet to his immense credit, time and time again, Luessenhop's audacious sequences of either the crime, the chase, or the collision of characters from opposite sides of the law keep us riveted from start to finish. 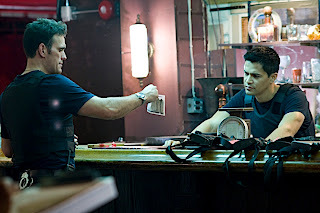 While The Town is easily 2010's most incredible work in the genre, Takers is still one surprisingly effective ensemble effort that, despite outshining Armored would – right along with it – comprise one hell of a two-sides-of-the-same-coin Matt Dillon heist movie double feature.